I will not enter into a discussion of typographical terminology here, attempting to explain the finer differences and relationships between characters, character sets, symbols, glyphs, alphabets, fonts, types, typefaces, etc. Suffice it to say that the term "font", as the word literally suggests, originally refers to metal printing types that are cast in a foundry, and are of a single style and size. So, the ubiquitous "Arial" is not a font but a typeface, that is: a font family; but "Arial 14 points bold" is a font. However, with the advent of computer-based word-processing combined with general ignorance, the word "font" has assumed the meaning of "typeface". In this section, I will use the incorrect "new speak" and use the words character and font in general. Over the years (ca. 1929 - 1960), several official Hellschreiber fonts have been designed. They all have in common that they were intended to maximize legibility (even with poor signal quality), preclude misinterpretation (mistaking one character for an other - even with poor signal quality), and minimize required signaling bandwidth. For this reason, Hell fonts are "upper case" only (capital letters), and some characters have an awkward shape - on purpose! In addition, Hell fonts are mono-spaced fonts: the bitmap of all characters of a particular font has the same width. Unlike a modern proportional font, in which for instance the letter "i" is narrower than the letter "w". Not so in Hell fonts! Fig. 1: Rasterization of the scripted character "3"
Fig. 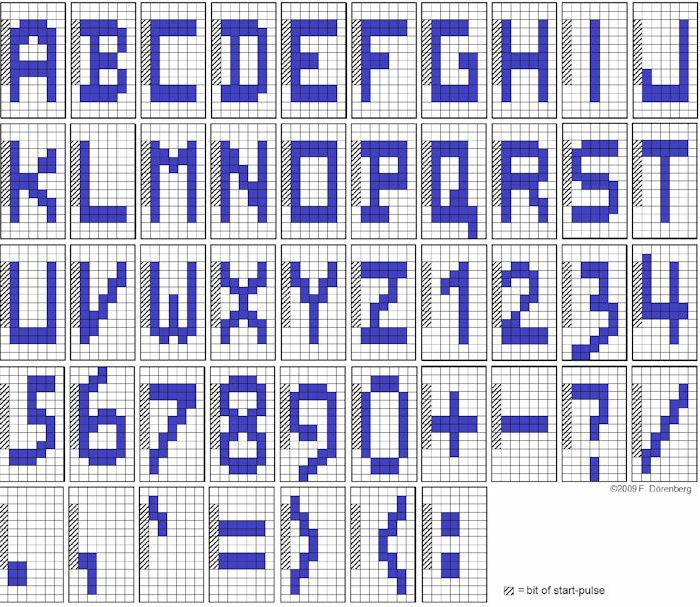 2: Serialization of the rasterized character "3"
The characters of all Hell fonts consist of a matrix of dots or "pixels" (picture elements). That is, they are simple bitmaps. Hence, they are "bit-map fonts" (a.k.a. "raster fonts") avant la lettre, as opposed to stroke fonts and outline fonts (a.k.a. vector fonts). 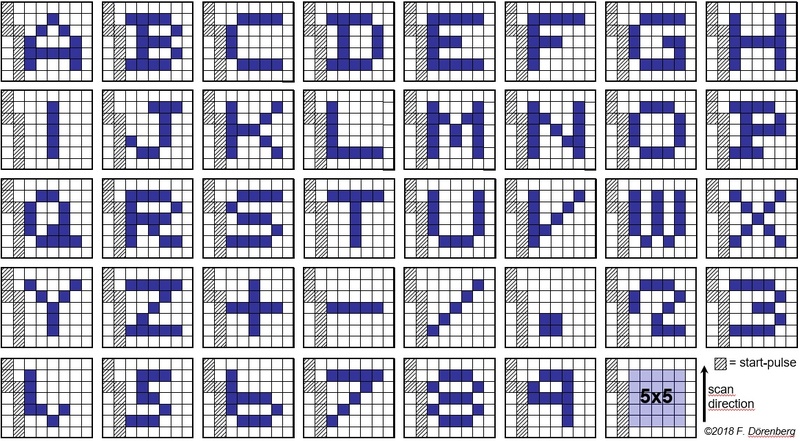 Dot-matrix dimensions: the number of rows and the number of columns of the character bitmap. In all the documentation of the Hell company and of Siemens-Halske, the number of columns is referred to as the number of lines (with a few exceptions). Scan direction: the pixels of the Hell font are transmitted sequentially, by "scanning" each column (see the "How it works" page). First the left-most column is scanned, then the next column to its right, etc. Scanning can be done by in a top-down manner, or bottom-up. Yes, there are other ways to do this (see further below). Inter-character space: in Hell fonts, the space between characters is created by leaving the first and/or last column(s) of the matrix blank (white). In most cases, this is the first and the last column, but some Hell fonts use the three last columns or the first two plus the last column. 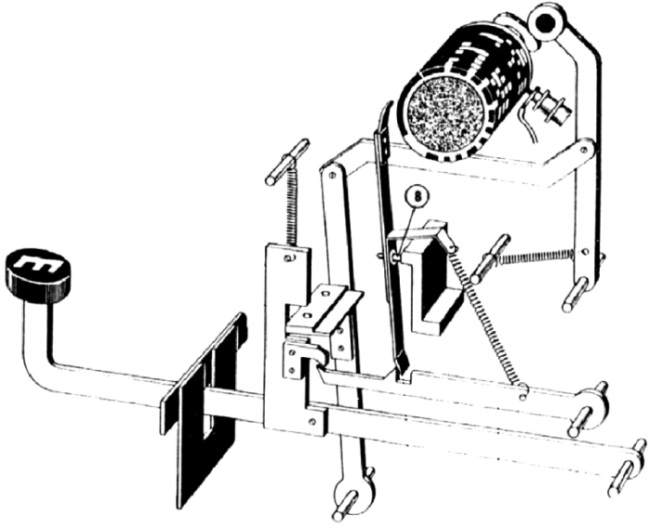 Note that Hellschreiber printers (other than synchronized "start-stop" models) use a two-turn spindle that prints two identical parallel lines of text. 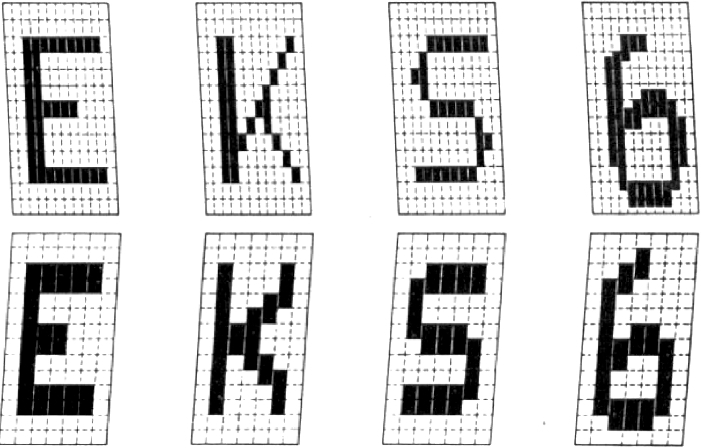 For these systems, the top and bottom row of the font are also left blank. This is done , so as to avoid that the top of the lower text line, touches the bottom of the upper text line. Start-pulse: some Hellschreiber models use a start-stop system. Their font conveniently "hides" a start-pulse in the normally blank first column: no need to expand the dimensions of the font matrix. This start-pulse only uses part of the first column. There is no need for a stop-pulse: upon reception of a start-pulse, the drive shaft of the Hell-printer makes a fixed number of revolutions and then stops. Note that the column that contains the start-pulse, is not printed. This reduces the space between printed characters by the width of one column. Character transmission rate: for hand-sent transmissions, the standard Hellschreiber rate is 2.5 characters/sec (150 chars/min); machine-sent transmission rates are 5 cps (300 cpm), 5.5 cps (330 cpm), and 6.1 cps (396 cpm). Pixel rate ("Punkfrequenz"): to limit the required signaling bandwidth, each Hell font has a specific minimum pixel duration. Hence, there is a minimum duration of a pixel cycle (1 black pixel, followed by 1 white pixel, or vice versa). The minimum is applied to both black and white pixels, and not only within columns, but also at the transition from column to the next. 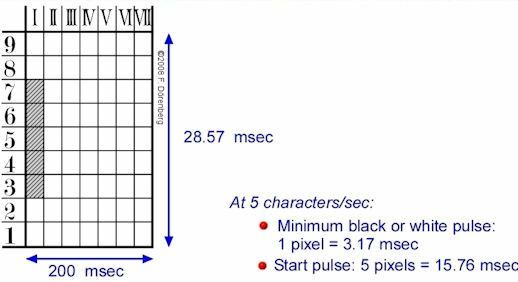 Combined with the number of characters that are sent per second, this minimum pixel cycle duration determines the maximum pixel rate. In turn, the latter rate drives the required signaling bandwidth (not to be confused with the "actual" or "occupied" signal bandwidth, that may be much larger if improper modulation is used). The required bandwidth is typically three times the pixel rate (so as to include at least the third harmonic), though extensive experiments of the Hell company and German government institutions determined that no more than 1.6 times the pixel rate is required, and a minimum of 1.2 times the pixel rate (bandwidth limiting on the transmitter side, not filtering at the receiver). Telegraphy speed (a.k.a. Baud rate): rate of the shortest signalling element. Before delving into the fonts, I would like to point out one consequence of the scanning direction. At the heart of all Hellschreiber printers, there is a spinning helix. 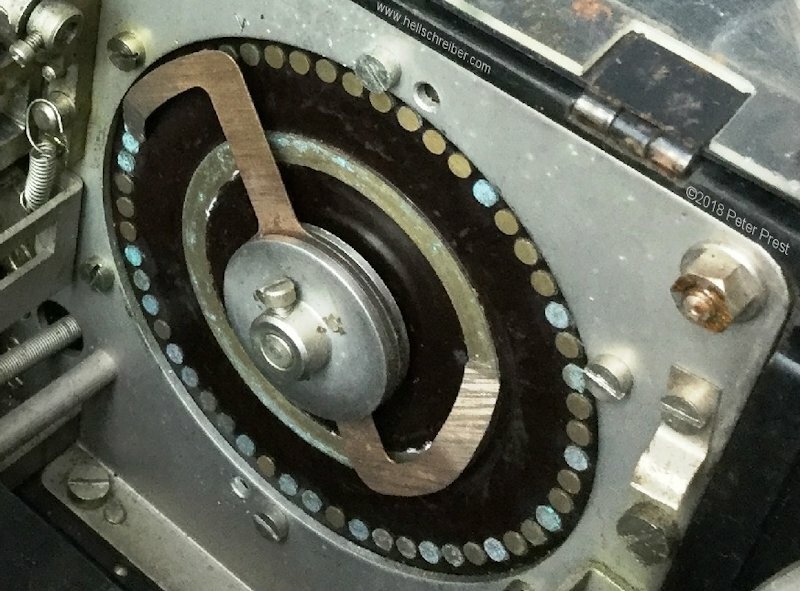 In all Hellschreiber printers, this helix spins in a clockwise (CW) direction (such that the spindle does not push against the movement of the paper tape). In all Hellschreiber printers, the paper tape passes this spindle from right to left. See the figure below. 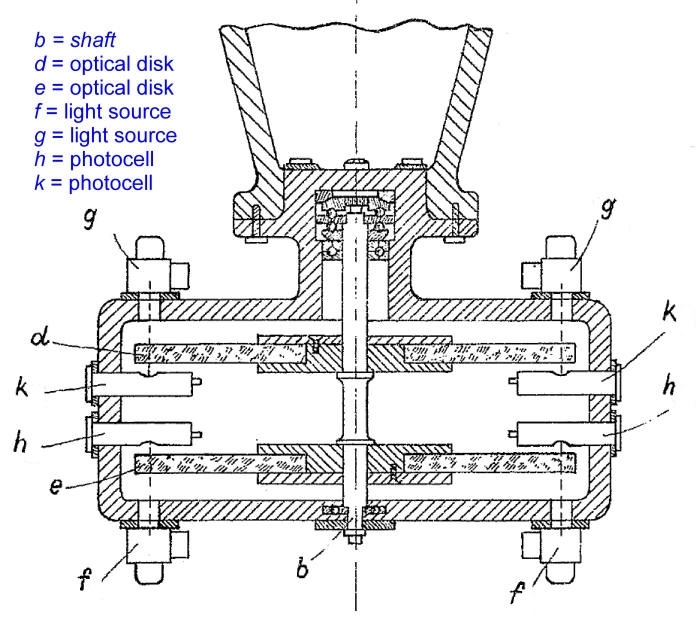 The printer spindle must "scan" in the same direction as the Hellschreiber-sender: top-down or bottom-up. Otherwise, the text is flipped vertically: printed upside-down and mirror-image. Spindles for top-down scanning must have a regular "right handed" thread (a screw with a right-handed thread is tightened by clockwise rotation). Conversely, bottom-up spindles must have a "left handed" ("British") thread. 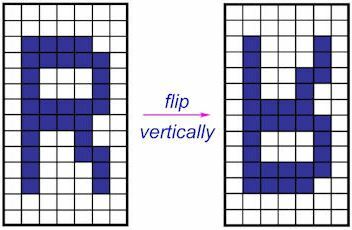 The combination of scan-direction and paper-direction causes "top-down" fonts to lean to the left when printed. Conversely, bottom-up fonts lean to the right when printed. 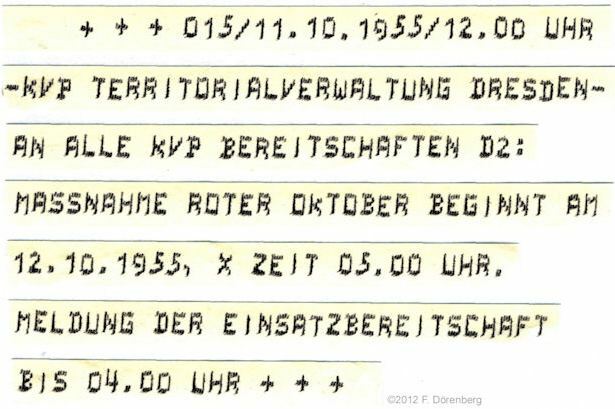 Note that this has nothing to do with slanting of the printed text lines, that occurs when the motor in the Hellschreiber-sender and printer run at different speeds. Finally, it should be noted that Hellschreiber printers (other than start-stop models) are extremely simple devices, and are dumb. They print all received signals - whether pixels, or noise pulses that are sufficiently strong and long. 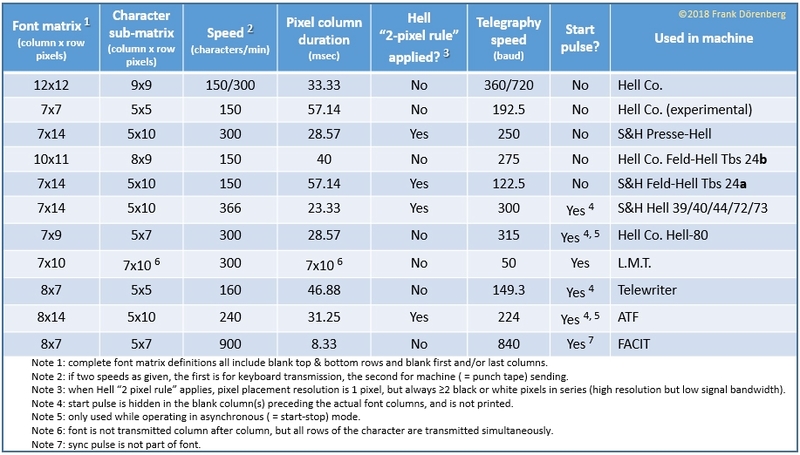 The Hell-printer spindle simply scans columns with a fixed speed. The printer is not designed for any particular font. Any font that is sent with the same column duration, will - in principle - be printed correctly. 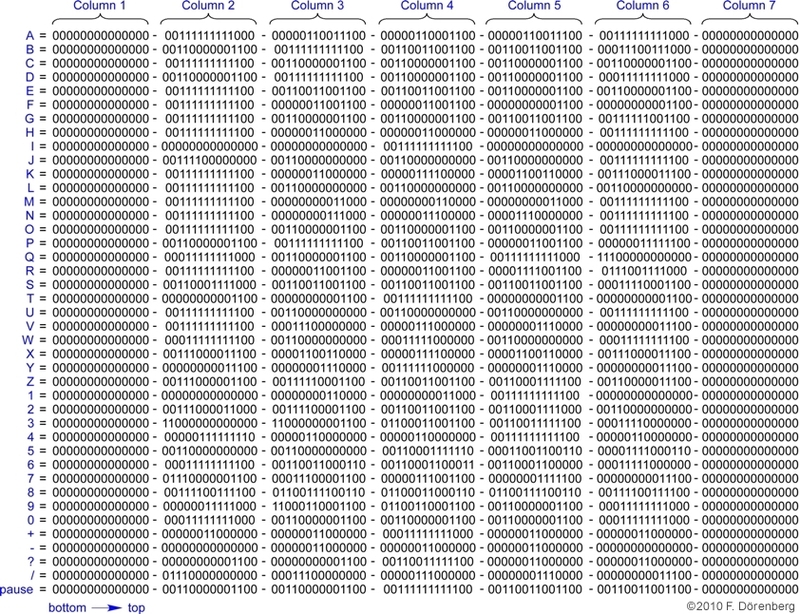 This is independent of the number of columns in the font matrix (which may be between 1 and infinite), and the number of pixels per column (provided the pixels are long enough with respect to the engage & disengage time of the printer's electromagnet). 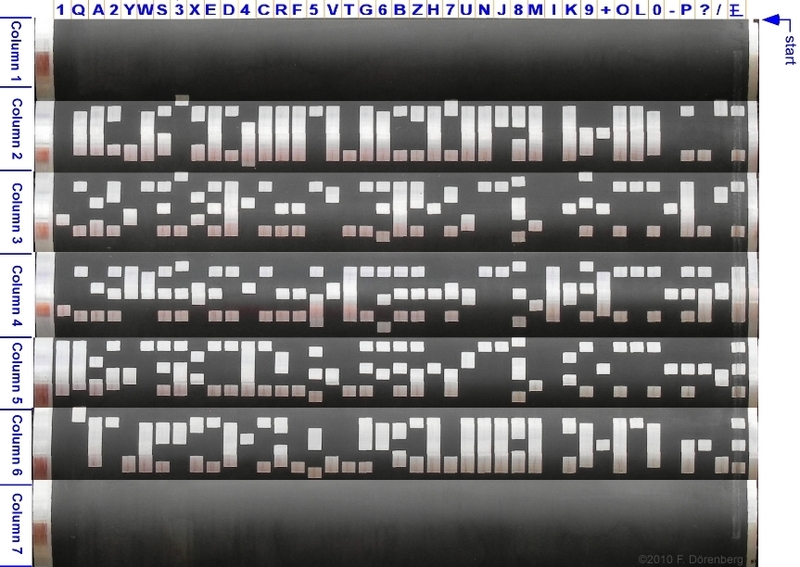 Below, the Hellschreiber fonts are not presented in a strict chronological order, but by the size of the font matrix. On the "Sounds from Hell" page, you can hear what some of these fonts sound like during transmission via tone pulses. Rudolf Hell's "first generation" printers (1929) were electro-chemical: they printed on chemically impregnated paper tape. The paper had to be moist, so as to be conductive to electrical current. Where current passed through the moist yellowish paper, the color of the chemical compound changed to Prussian blue. This generation of Hell-printers did not use a printing helix. Instead, it had 14 styluses, placed into a column across the paper tape, touching the tape. Current could be sequentially applied to each individual stylus ( = scan). The current circuit is closed via the moist paper tape and a metal roller underneath the tape. The photo below shows a print-out that was generated with this type of Hell-printer. 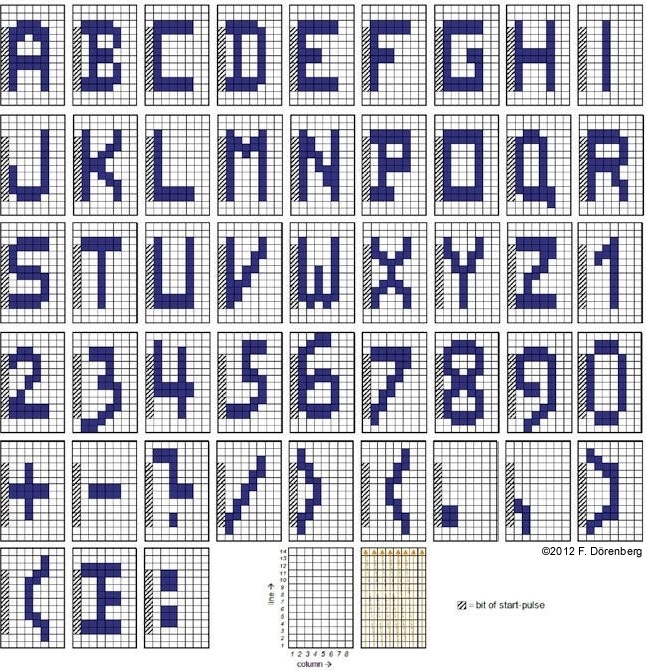 Obviously, with a 14-pixel column, the resulting font consisted of 14 rows. The available documentation does not indicate the number of font-columns. From inspection of the photo it appears that the font had 9 pixel-columns, and 2 blank columns for spacing between characters. However, the photo only covers half of the alphabet. Dot-matrix dimensions: 14 rows, 11 columns (unconfirmed). Scan direction: horizontal, row-sequence unknown. The second generation Hellschreibers printers were not electro-chemical, but electro-mechanical. 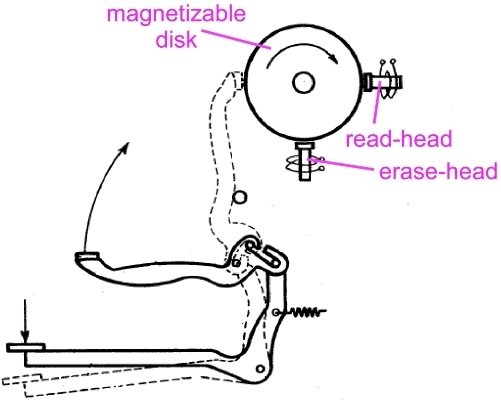 The printers used a spinning helix (spindle) to obtain a scanning movement across the paper tape. At this time, Rudolf Hell had already licensed his "Hellschreiber" patents to the Siemens-Halske company, who became the Hellschreiber manufacturer. Initially (1931), these new printers were carbon tape printers: they used a thin carbon-ribbon between the paper tape and the spindle. In 1933 the carbon-ribbon approach was abandoned in favor of a simple felt ink-roller that rests on the spindle. A 12-line font was used with these printers, and starting in 1933/34, also with the first "Presse Hell" printer model (T empf 12). 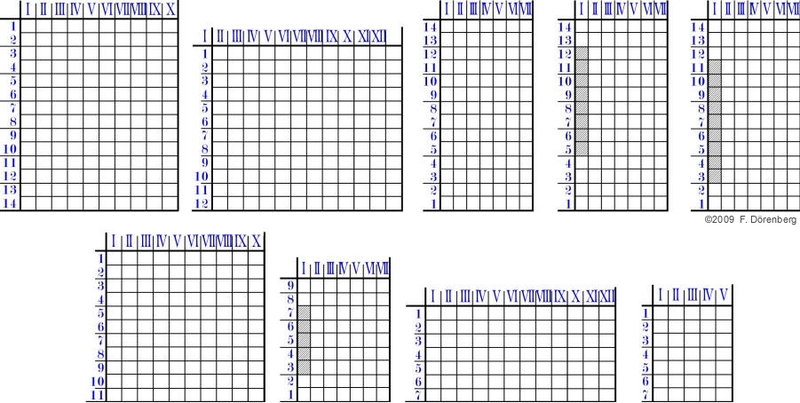 12 columns, 12 rows, with 9 columns used for pixels, but the first 2 columns and the last column used for spacing (ref. 2, 3). 12 columns, 13 rows (ref. 3, 4). 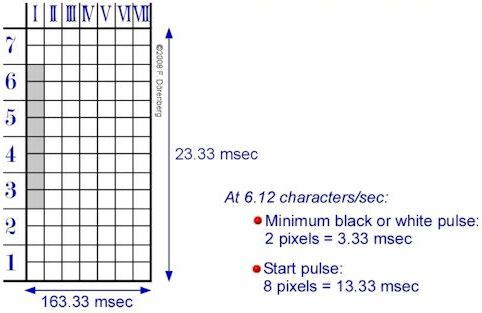 At 2.5 characters/sec, the shortest "black" pulse was 2 msec, and the shortest "white" pulse 3.12 msec (ref. 5, 33). I.e., the shortest pixel-cycle was 5.12 msec, resulting in a telegraphy speed of 1000/5.12 = 195 Bd . According to ref. 4, this font was used for manual transmission at a rate of 2.5 characters/sec (150 chars/min), and machine-transmission (punch tape) with 5 chars/sec (300 chars/min). Dot-matrix dimensions: 12 rows, 12 columns. Character transmission rate: 2.5 and 5 characters/sec (150 and 300 chars/min). Pixel rate: for 5 chars/sec, 5x(144/2)=360 Hz; telegraphy speed: 5x144=720 baud; shortest pulse: 1000/720=1.39 msec. Note that this required a very fast electromagnet in the printer! 1935 was de first year of production of the famous Hell Feldfernschreiber, a Hellschreiber sender/printer for military field operations. This "Feld-Hell" is referred to as "T typ 58" (the type designator of the manufacturer, Siemens-Halske), and by its drawing number: "Typensbildschreiber" Tbs 24a. That same year, the Hell company started the (limited) manufacturing an other version of the "Feld-Hell": Tbs 24b. It has a font that is quite different from Tbs 24a Feld-Hell. The latter has a 7x14 font, described further below. The Tbs 24b uses a 10x11 font. This appears to be a transition between the 12x12 font and the 7x14 font. Some characters look strange or incorrect (e.g., the "Y"), but the depicted font is that of the actual character drum. 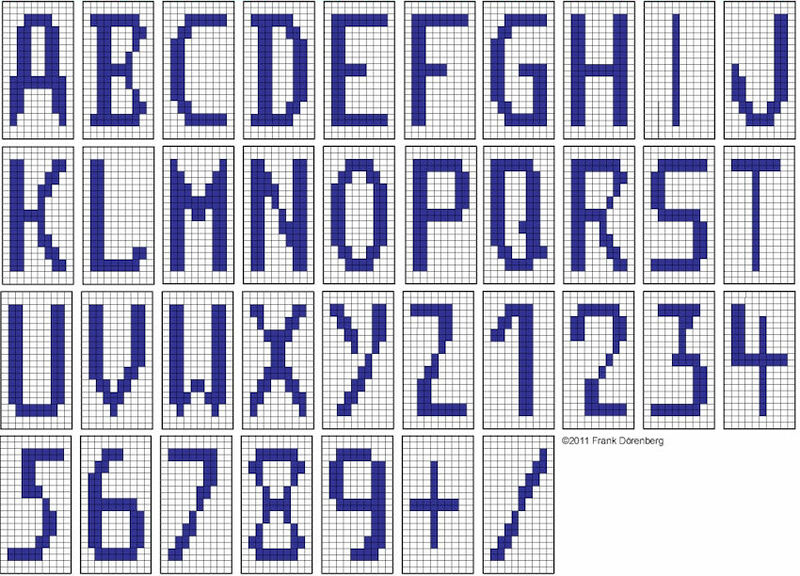 As the number of columns is even, characters such as T and I are not centered on the pixel mosaic. Fig. 12: The 10-line font of Hellschreiber "Tbs 24b"
Dot-matrix dimensions: 11 rows, 10 columns. Inter-character space: 2 columns (first & last). Character transmission rate: 2.5 characters/sec (150 chars/min). Pixel rate: 2.5x(110/2)=137.5 Hz; telegraphy speed: 2.5x110=275 baud; shortest pulse: 1000/275=3.64 msec. It did not permit the use of narrow filters in the receivers (to suppress interference from other transmitters, or certain effects of signal propagation). Echoes during longwave (LF) and very-longwave (VLF) communication caused unacceptable distortion of printed characters. Likewise fading, multipath propagation, and pulse "stretching" caused by the Heaviside-layer (ref. 33). Complaints about interference, primarily upon introduction of Hell transmissions by operators who only had a small bandwidth allocation for their services (cf. p. 3 in ref. 5). Not all "land line" telephone systems could accommodate that bandwidth in the 1920s/30s. The only solution was to reduce the telegraphy speed. 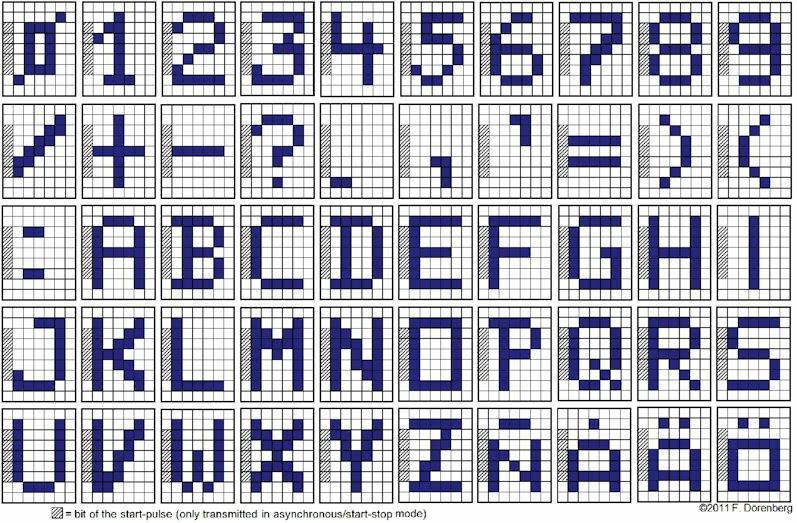 This could be done in two ways: reduce the character transmission rate (characters per second), and/or reduce the number of pixels in the font. The character transmission rate could really not be reduced: 2.5 chars/sec corresponds to a decent manual typing speed, and the 5 chars/sec machine-sent rate had to compete with other types of teleprinter systems. Hence, the number of pixels in the font matrix had to be reduced. Hell settled on a 7-line font. This new font actually resulted in better legibility than the 12-line font. The conversion from 12- to 7-line font required several changes to the Hell-printer: gear ratio between motor and spindle, gear ratio between spindle and paper tape transportation, turn direction of the spindle, spindle with left-hand thread instead of right-hand (ref. 33). The Hell-service of Reuters' news agency changes from the 12-line to 7-ine font in August of 1939 (ref. 35). The 7-line font was first used in 1935 with the military Hell Feldfernschreiber ("Feld-Hell", T typ 58, Tbs 24a). It has a transmission rate of 2.5 characters/sec. Several years later (1939/40) it was also used with the second generation "Presse Hell" printers (T empf 14), at 5 chars/sec. With this font change, the scan direction was also reversed: from top-down to bottom-up. However, it was realized that the resolution could be doubled to that of a 7x14 matrix - without doubling the signaling bandwidth! This is cleverly done by applying the "2-pixel rule" to the 7x14 font. This is equivalent to shifting pixels in the 7x7 font by half a pixel. The minimum pixel duration is not affected! 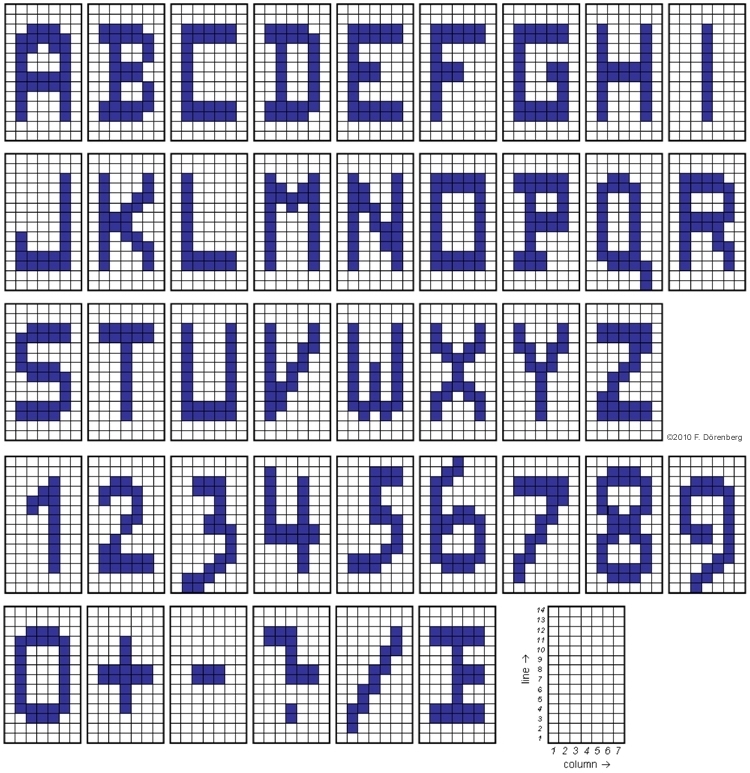 So, the final 7-line font design settled on a 7x14 matrix: 7 columns of 14 pixels. The first and the last column are used for character spacing. The top and bottom rows are also not used (exceptions are the "tails" of the characters Q, 3, 6, 9 ). As it turned out, this font actually also improved legibility compared to the 12-line font (ref. 6, 8)! Compare the 1930s Hell-font to a "modern" PC font on an LCD screen. OK, it is the close-up of a small-size true-type font, so vector based rather than bitmap or raster. But still, it is clearly based on the Hell-invention. I have used FontStruct™ to capture the above Feld-Hell character set as a "TrueType" font that can be used in regular Windows® and MacOS® programs (e.g., Word®, PowerPoint®). Note that only the 41 characters above are defined; use the # key for the pause character. Lower-case A-Z map to upper-case. This is the Hell "pause" character. It is used by the Hell Feldfernschreiber, Model "T.send.46" combined printer & punch-tape sender, and the "ATF" Hellschreibers. It was used during speed adjustments between two stations, and when having to keep a phone line or radio frequency occupied. 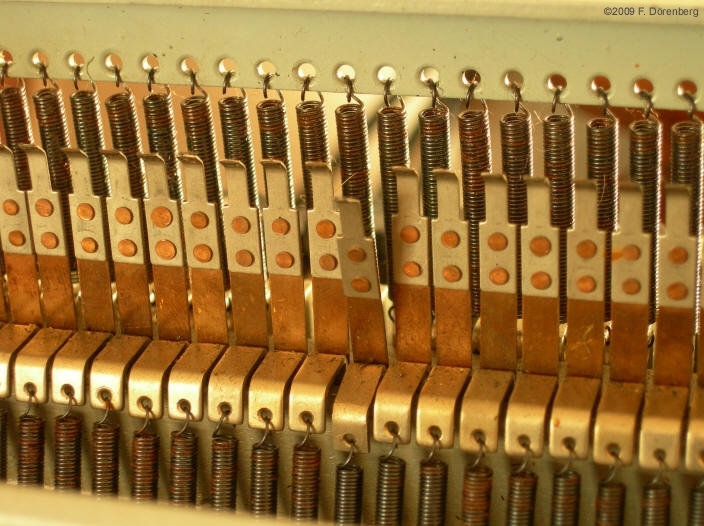 When the "pause" character key is selected, a feature in the keyboard of the Feldfernschreiber locks that key, and another mechanism ensures that only one out of every four is actually transmitted. If Unicode 12.0 (or newer) is installed for your browser, the next two characters should be the Hell Pause symbol: ⯿ ⯿. Dot-matrix dimensions: 7 columns, 14 rows. Character transmission rate: 2.5 characters/sec (150 chars/min) or 5 chars/sec (300 chars/min). Size of printed characters: the hub of the printer spindle is 2x6=12 mm, the paper tape moves at nearly 47 cm/min (≈1½ ft/min), 150 characters are sent per minute (2.5 chars7sec), the first & last column of the font are blank for character-spacing, the two top & two bottom rows are blank for line-spacing (with some exceptions). Hence, the printed characters are (10/14)x6= 4.3 mm high and (5/7)x470/150=2.3 mm wide. Ca. 1952, Siemens-Halske introduced a Hellschreiber with a start-stop system: the T typ 72 "GL". 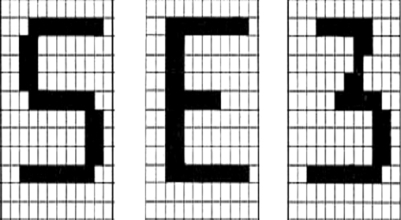 It used the same 7x14 font as the Feld-Hell and the T empf 14 "Presse Hell", with some minor stylistic modifications (e.g., to the K, Q, and ? ), and several additional characters (the punctuation marks . , : ' ) ( as well as the = ). 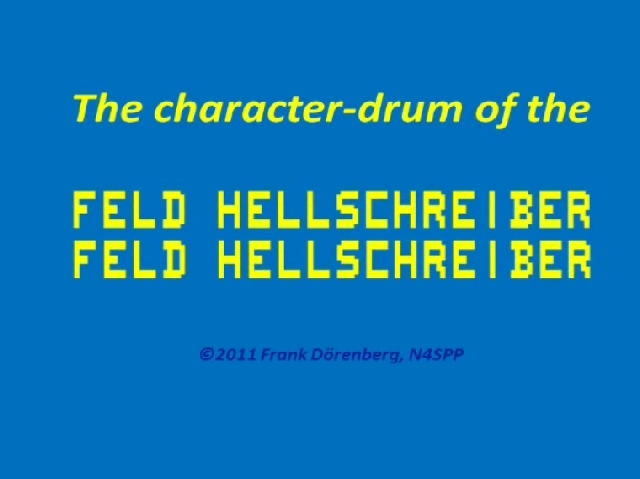 The font does not include the Feld-Hell's pause-character. Start-stop operation was enabled by a start-pulse hidden in the first column. It has a duration of 8 pixels (out of the 14-pixel column), but this column is not printed (obviously, the start-pulse must be detected before the printer mechanism can be enabled). As a consequence, the spacing between printed characters is reduced by 50% (from two columns to one). The "GL" basically uses the same typeface as the Feldfernschreiber, without the pause-character, but expanded with . , ' = ( ) : and some modifications to the E, K, Q, = and ? The binary form of the "GL" font is here. With the start-stopsystem, the sender and receiver/printer are synchronized for each character. So there is no need to print two identical lines of text. Hence, the thread of the printer spindle only has a single turn instead of two, and the paper tape is narrower (9.5 mm vs. 15 mm). Character transmission rate: 6.12 characters/sec (367 chars/min). This is similar to the the 6 or 6.6 cps of RTTY "telex". The traditional US RTTY speed is 45.45 Bd / 6 chars/sec / 60 wpm, whereas the traditional European speed is 50 Bd, 6.6 chars/sec / 66 wpm. Pixel rate: 6.12x(7x14/2)/2=150 Hz; telegraphy speed: 6.12x(7x14/2)=300 baud; shortest pulse: 1000/300=3.33 msec. During the late 1950s, the Hell company developed the world's first fully electronic teleprinter for the West-German military (the Bundeswehr) and commercial customers: the Hell-80 (model "T typ 80"). It can operate in two modes: asynchronous ( = start-stop) via keyboard or punch-tape, and synchronous (like the Feld-Hell) via the keyboard. It uses a 7x9 font. The start-pulse is only used in the start-stop mode. The binary form of the Hell-80 font is here. Dot-matrix dimensions: 7 rows, 9 columns. Inter-character space: 1 column (in start-stop=asynchronous mode), or two columns (first and last, in synchronous mode). Start-pulse: yes (pixels 3-7 in the first column; 15.76 msec). Tests with several Hell-80 machines have shown that a start-pulse is already detected after 4.4 - 4.8 msec. That is, after about 1.5 out of the 5 transmitted start-pulse pixels. Character transmission rate: 5 characters/sec (300 cpm). Pixel rate: 5x(7x9)/2=157.5 Hz; telegraphy speed: 5x(7x9)=315 baud; shortest pulse: 1000/315=3.17 msec. During the mid 1930s, the French company LMT developed a 7-tone teleprinter system. Like the Hellschreiber system, it is based on transmitting a pixel stream that are printed in real-time, without encoding. 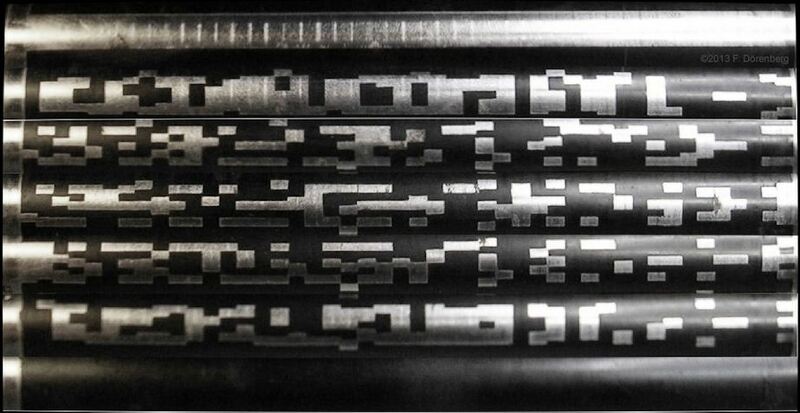 Like the old 14-line and 12-line Hellschreibers with electro-chemical and carbon-ribbon printers, the LMT system simultaneously scans all rows of the font. A separate tone frequency is used for each row. These days, this would be referred to as "Concurrent Multi-Tone" (C/MT) Hell. The LMT system uses a font that has 7 rows of 10 pixels (max). Black pixels are actually represented by absence of the tone. Each transmitted character is preceded by a start-pulse that is not considered part of the font. This start-pulse is generated by briefly suppressing the tones of the odd-numbered rows of the font (1, 3, 5, 7). Of these 39 patterns, several are the combination of two other such patters. 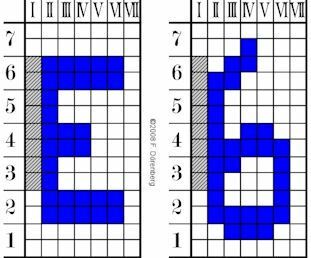 E.g., pattern 16 is the combination of pattern 2 and 7. This allowed the number of required elemental line patterns to be reduced to 23. Hence only these 23 were "programmed" into memory, in the form of 23 continuously turning notched disks. A rather complicated electro-mechanical buffer/combiner/sequencer was required to generate the character patterns (cf. figure 3 in ref. 12A/B). Dot-matrix dimensions: 7 rows, 10 columns (excluding inter-character space). Scan direction: horizontal, all rows simultaneously. Start-pulse: yes, preceding the actual font (the "normally on" tones of rows 1, 3, 5, and 7 are briefly turned off). 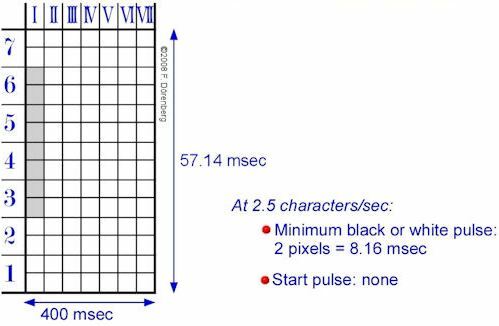 Pixel rate: 5x10/2=25 Hz; telegraphy speed: 5x10=50 baud; shortest pulse: 1000/50=20 msec (ref. 13). During WW2, a small portable keyboard Hellschreiber was developed and manufactured in the UK: the G.T.L. Telewriter. Dot-matrix dimensions: 7 rows, 8 columns. Start-pulse: yes, preceding the actual font. Character transmission rate: 2.7 characters/sec (160 cpm). Pixel rate: 2.7x(7x8/2)=74.7 Hz; telegraphy speed: 2.7x7x8=149.3 baud; shortest pulse: 1000/149.3=6.7 msec. In the early 1950s, a Hellschreiber was developed in the German (not-so) Democratic Republic ("East Germany"). It went into service with the Kasernierte Volks Polizei (KVP - Barracked People's Police). In 1956 the KVP was absorbed into newly formed army of East Germany; the Nationale Volks Armee (NVA - National People's Army), where these machines continued to be used. This Hellschreiber was directly based on Feld-Hellschreiber technology, and early production units actually contained components abandoned by the Hell company in Berlin at the end of World War 2. It is referred to as an Abtastfernschreiber (ATF), so as to avoid using the Hell name (and make the patent infringements too obvious). The term "Abtastfernschreiber" was actually not new: Hellschreibers were referred to as "Abtast-Telegrafen" at least as early as 1940 (ref. 14). The ATF basically uses the same 7x14 font as the Feld-Hell and the Hell "GL". It has an additional blank column, and a slightly longer start-pulse than the Hell "GL". With 4 characters/sec, the transmission speed is between that of the Feld-Hell and the Hell "GL". Dot-matrix dimensions: 8 columns, 14 rows. Inter-character space: 2 columns (last 2). Start-pulse: yes (pixels 3-11 in the first columns; 22.96 msec). Character transmission rate: 4 characters/sec (240 chars/min). Pixel rate: 4x(7x14/2)/2=98 Hz; telegraphy speed: 4x(7x14/2)=196 baud; shortest pulse: 1000/196=5.1 msec. During the 1970s, the Swedish company FACIT developed an "alphanumeric strip printer". Basically a remote dot-matrix printer, based on the Hell system (i.e., serialized pixel streams). The maximum printing speed is 15 characters per second. The system uses a 5x7 font, with 64 defined characters. Each column takes 6.9 msec to print (1 msec per pixel). Including dwell time between columns, a character takes 45.7 msec. Dot-matrix dimensions: 5 columns, 7 rows. Start-pulse: yes (part of the digital transmission, not part of the font). Character transmission rate: 15 characters/sec (900 chars/min). Pixel rate: 1000/2=500 Hz, telegraphy speed: 1000 baud; shortest pulse (ref. 15): 1 msec. 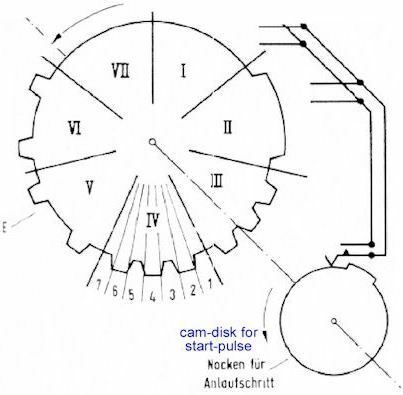 Stack of cam wheels (notched disks) with relay contacts ("Nockenscheibensatz + Zeichenkontakte"). 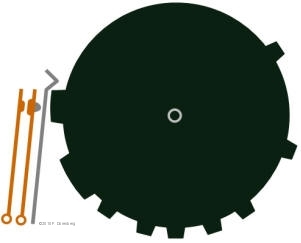 Character drum with slip-contacts ("Kontaktwalze"). Glass disk, with light source and photocell. Through the 1950s, most of the Hellschreiber character generators ("Sender", "Geber") used a stack of notched disks as character memory. This was used in both keyboard and punch-tape reader senders. The stack has a separate disk ("Nockenscheibe") for each individual character. Each disk has its own set of contacts. The size and position of the notches on the circumference of the disk corresponds to the pixel pattern of the character (including a start-pulse, if part of the font). The pixel sequence is obtained by arranging the font columns in a tail-to-head manner (bottom of column 2 after top of column 1, etc.). All disk-contacts are connected in parallel. When a contact is closed by a passing notch, the sender outputs a tone pulse, or closes the keying contact of transmitter. Fig. 41: Stack of notched disks from a Siemens-Hell-Geber "T send 62a"
The stack spins continuously. The contact of a character-disk is only engaged (mechanically), upon selection of the associated character via the keyboard or punch tape. This is done to avoid excessive wear on the notches and the contacts. The pixel stream must start at the first pixel of the first column, and "scan" from there. For a transmission speed of 5 characters/sec, the stacks spins at 300 rpm (150 rpm for 2.5 chars/sec). Obviously it is physically impossible to time this correctly when typing characters on a keyboard. This is why the keyboard has a lock-out mechanism that is driven by a separate single-notch cam wheel at the end of the stack. The keys of the keyboard can only be depressed during a short period just before the first pixel of the first column. The selected character-contact remains engaged for one revolution of the stack. The contact is disengaged at the end of the revolution, end the keyboard is enabled again for the next character, etc. Note that the idea of using a stack of notched disks combined with a "fingerboard" was already proposed for Morse telegraphy in 1894 (ref. 19). There is no evidence of a working model ever having been constructed. There is one disk per character, and the Morse code of the character is repeated several times along the circumference of the disk. The disk is rotated over the length of a single character - with the non-constant speed of pushing the associated key of the "fingerboard". 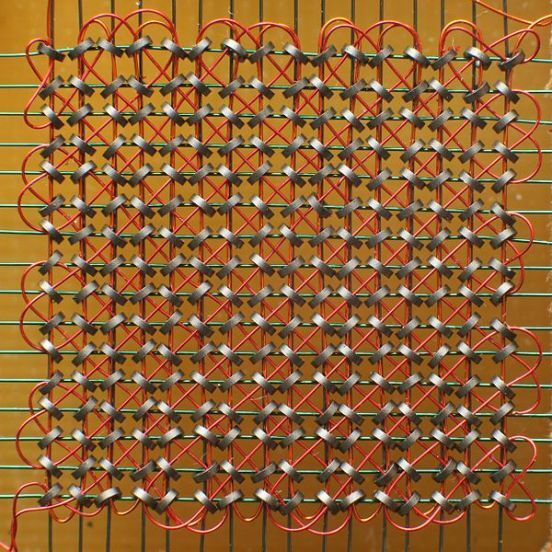 A stack of notched disks with pre-programmed Morse code messages is also at the heart of the "Omnigraph" telegraphy training device of the early 1900s (ref. 20, 21). 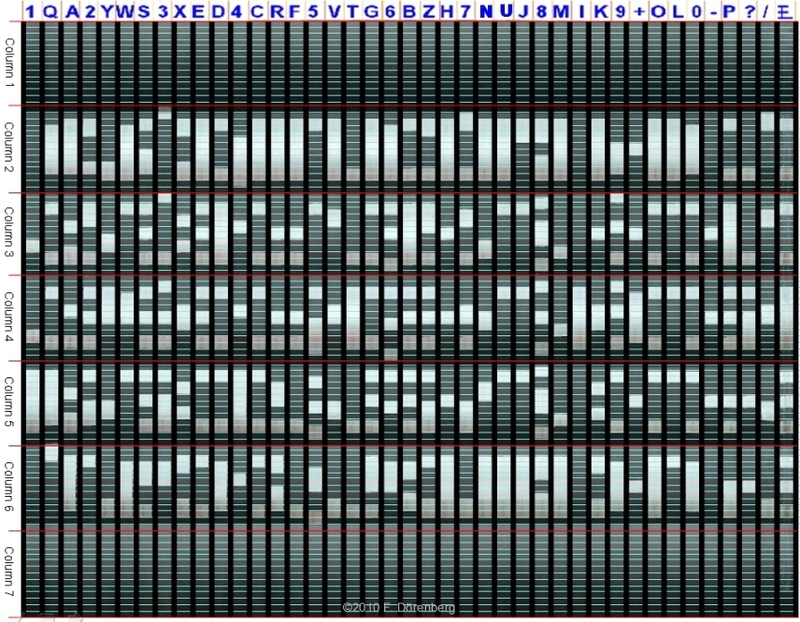 Each disk captured five sets of 6-7 Morse characters. Depending on the model, 1, 5, or 15 disks could be stacked. It was advertised in the "Popular Mechanics" magazine throughout the 1910s and 1920s, as well as in the famous Sears-Roebuck catalog (my grandparents actually kept one in their outhouse - catalog that is, not an Omnigraph!). There is a slight variation on the above "stack of notched disk" method. It is used in the Hell Feldfernschreiber (both model Tbs 24a (made by Siemsn-Halske) and Tbs 24b (made by the Hell company)) and the post-war Abtastfermschreiber (ATF, made by RTF). Here, the stack of notched disks is retained, but the space between the notches is filled in with a hard insulating material ("Isoliermasse"). The surface is turned to its final diameter on a lathe. The stack is now a smooth cylinder, referred to as the "character drum" ("Kontaktwalze", "Geberwalze"). 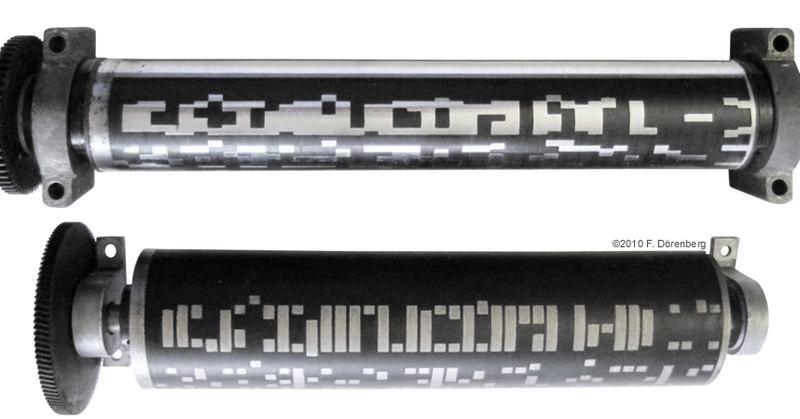 The "black" pixels are captured in the form of conductive metal patches that are embedded into the surface of the drum. The "white" pixels are simply formed by the dark, non-conductive material of the drum. The notched disk are made of metal. 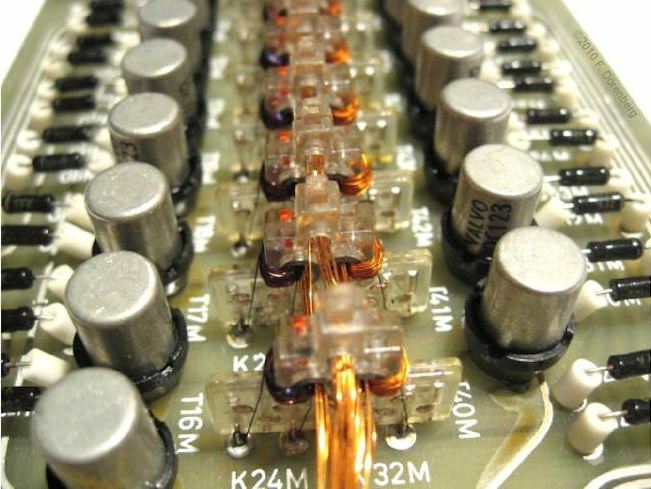 As they are tightly stacked, they are electrically interconnected. Hence, all pixel-patches are also interconnected. The final disk of the stack forms a continuous "common" track at one end of the drum. Per ref. 14, the metal patches are made of nickel. Several Feld-Hell owners have observed that the slip-contacts cause wear marks on the drum-contacts that reveal brass underneath. This implies nickel plated patches, rather than notched disks that are entirely made of a nickel-steel alloy. A standard V2A nickel-chrome-steel alloy was used for the tips of slip-contacts. This is a very hard alloy, highly corrosion-resistant, and the surface can be polished to the permanent mirror finish that we see on the character drum. Ref 25, 26. The V2A alloys contain 15-40% chrome, 4-20% nickel, and have a low carbon content (less than 1%). It was patented by C. Pasel of Essen/Germany in 1912 (ref. 26), and was covered during the early 1920s by related patents of Benno Strauss (of the renowned Krupp steel company, also located in Essen). Instead of a relay-contact, each disk has a slip-contact ("Schleifkontakt"). Again, a contact is only engaged for one revolution of the drum, and the keyboard is only briefly enabled just before the first pixel of the first column (1-notch cam attached to the end of the drum). All slip-contacts are also interconnected. 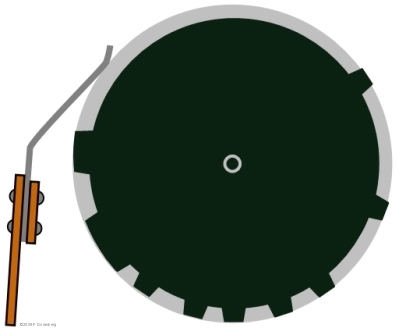 To close the circuit, there is a carbon brush that rides on the continuous common track of the drum. 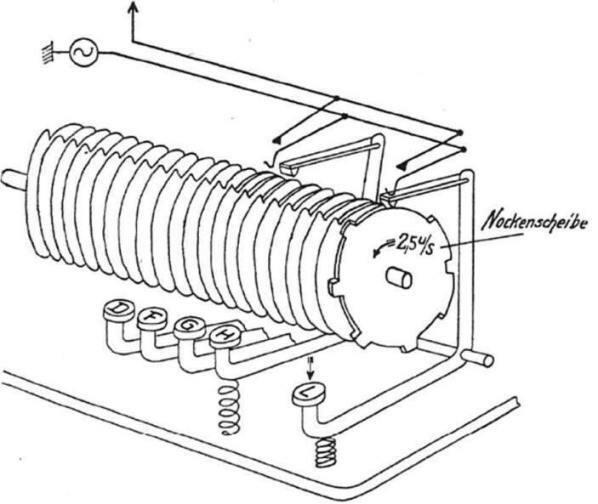 The photo below shows a number of the slip-contacts and associated springs. The actual steel contacts are attached with two copper rivets. Fig. 52: The tracks of the character-drum divided into individual "pixels"
There are 41 characters of 7 x 14 bits each. Hence, the Feld-Hell's character drum is actually an electro-mechanical 4 kilobit Non-Volatile Read-Only Memory that weighs about 1 kg (2 lbs)! 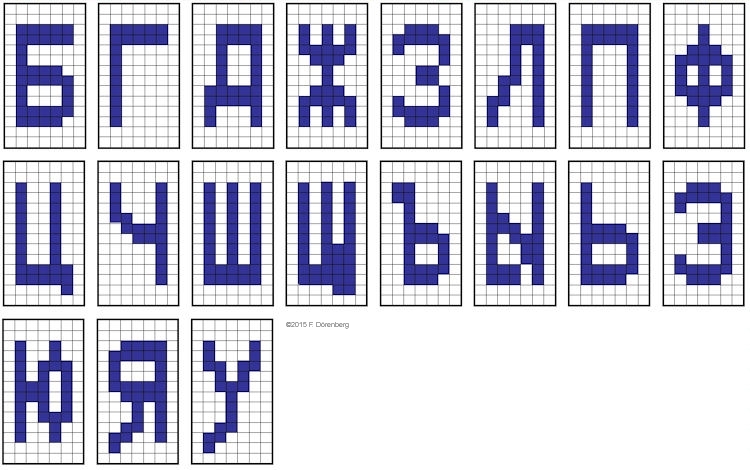 A text file with the above binary pixel-pattern is available here. Access the video file here (3 formats): video.mp4, video.webm, video.ogv. The 7x14 font of the Abtastfermschreiber (ATF), is also implemented as a character drum. The start-pulse is clearly visible at the top of the photo below. Also note that, unlike the Tbs 24a and Tbs 24b above, pixel patches of adjacent characters are interconnected at the surface of the drum. Hence, it is unclear if the drum indeed consists of a stack of notched disks. The concept of using a drum on which characters are encoded as a sequence of conductive and non-conductive patches, dates back to the early 1900s. 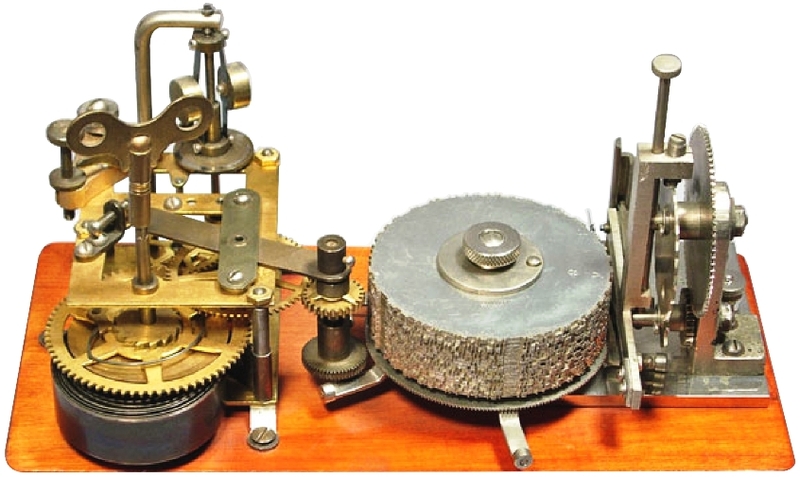 The "Natrometer" is a variation on the Omnigraph Morse code training device that is shown further above. It has a drum that consists of a stack of smooth metal (aluminium?) rings. Each ring captures the "dits and dahs" of several dozen Morse code characters. The rings have a dark, non-conductive coating, except for each "dit" and "dah". The photo below shows a Nanometer with nine tracks and associated slip-contacts. During WW2, a small portable keyboard Hellschreiber machine was developed and manufactured in the UK: the G.T.L. Telewriter. Its keyboard arrangement resembles that of a regular teleprinter. However, instead of cross-bars, a cross-wire system is used, in combination with a rotating distributor that scans the cross-wires. Fig. 60: Keybar of the letter "E"
When a key of the keyboard is pushed, the protrusions of that key's keybar descend onto the cross-wires. This connects each contacted cross-wire to ground/common of the keyboard. Pushing a key also engages the drive system of the machine, which causes the wiper contact of the distributor to make one complete revolution. All 56 stud contacts are scanned in sequence. Each stud contact that is connected to ground/common (i.e., the start-pulse and the key-specific "black" pixels) causes a DC pulse to be sent to the printer mechanism of the local machine and of the remote machine. 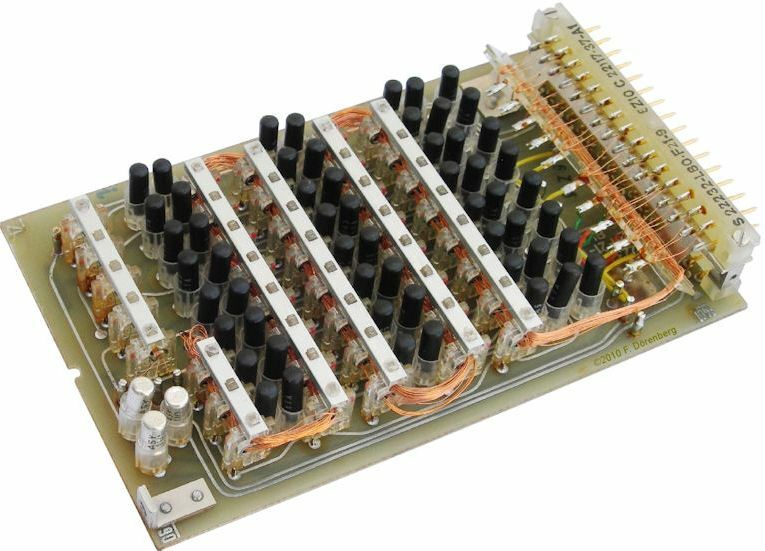 The 7x9 font of the Hell-80 machine is stored in a magnetic core memory - a technology dating back to the early 1950s. It uses pairs of small ceramic magnetic rings (the "cores", "Ringkerne"). Several wires are treaded through each of the cores, to provide read/write access. Addressing signals are provided by the decoder-card shown further below. Rudolf Hell also patented another form of magnetic font memory. The sender device resembles a conventional typewriter, but is combined with magnetic tape recorder technology. 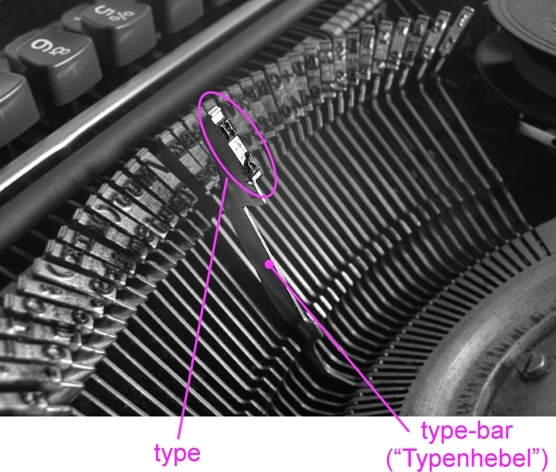 Here, each "type" (i.e., the "hammer" head of a type-bar of the keyboard) has magnetic strips on it, instead of a mirror-image character glyph. Of course, sequences of black and white pixels can also be captured optically. One way to do this is with a transparent disk (e.g., made of glass). A photographic process could be used to implemented the pixels as dark spots or line segments. Conversely, the disk could have a dark surface, and engraving or a photochemical process used to remove this surface for pixels. The pixels could be arranged as a ring near the edge of continuously spinning disk, as shown below. A focused source of light would illuminate the pixel track, and a photocell on the opposite side of the disk would detect the presence or absence of light, according to the pixels passing by the light source. It would require some special mechanism to use the optical disk memory with "random access" via a keyboard or punch-tape reader. However, it is very well suited for applications where a long, fixed pixel sequence is repeated continuously. This was actually used during World War 2, in the German "Bernhard/Bernhardine" radio navigation system for aircraft. This system used an enormous antenna array that rotated continuously (2x per minute). The momentary azimuth of the antenna ("pointing direction" relative to magnetic north) was continuously transmitted in Hellschreiber format, in the form of a compass rose. The pixel sequence of the entire compass rose ("Gradskala"), with 10-degree values and degree tick-marks) was implemented as an optical disk. The (large) disk was mounted onto the shaft of the rotating antenna. A Hellschreiber printer in the aircraft would print the compass rose onto paper tape. A second Hellschreiber printer-track would simultaneously print a bar-graph of the signal strength of a second antenna, pointing in the same direction as the primary antenna. However, this second antenna had a sharp null in the direction of the primary antenna, and transmitted a continuous signal. The sharp minimum of the bar-graph printout pointed precisely at the value of the antenna azimuth on which the aircraft was located. Fig. 71: Re-created signal strength bar graph, azimuth data, with station identifier "M"
The letter "M" in the partial compass rose shown above, is the identifier of the transmitting station. There was a number of these navigation stations in Germany, France, Denmark, The Netherlands, Poland, Czechoslovakia, and Austria (not all operational). Each had its own identifier letter. 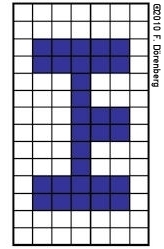 The Hellschreiber pixel pattern of the identifier was implemented on a separate disk. These optical disks had a single, circular recorded track, and turned at 2 rpm (the antenna had a diameter of about 35 meters - 120 ft). 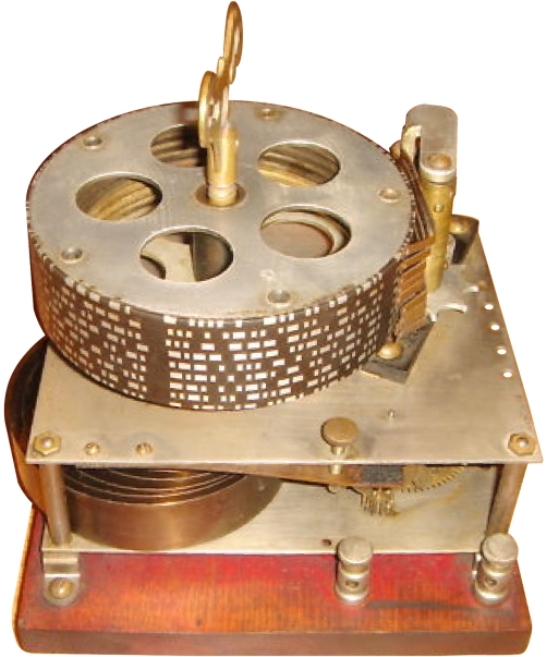 An other optical disk system for "on-off keyed" signals, is the Morse-code practice device shown below (ref. 35). It uses two-sided cardboard disks, with a diameter similar to that of conventional LP gramophone records. The disks shown (per Luftwaffe standard LDv 704) are from the Luftnachrichtenschule (Luftwaffe Signal Corps School), whereas the record player from the early 1940s is a Kriegsmarine (Navy) device. The player collimates light into a tiny square spot (≈1 mm2). Reflections off the disk are detected by a photo cell. Replay-speed can be varied (30/60/75/150 chars/min = 6/12/15/30 WPM). The audio tone can be varied independently. I have put a red/green 3D photo of this training equipment here. Fig. 73: Optically encoded disk of a "MÜG.Mar." This optical disk concept was expanded decades later (in the 1970s, originally by Philips, later together with Sony), in the form of the Laserdisc and Compact Disc (CD). 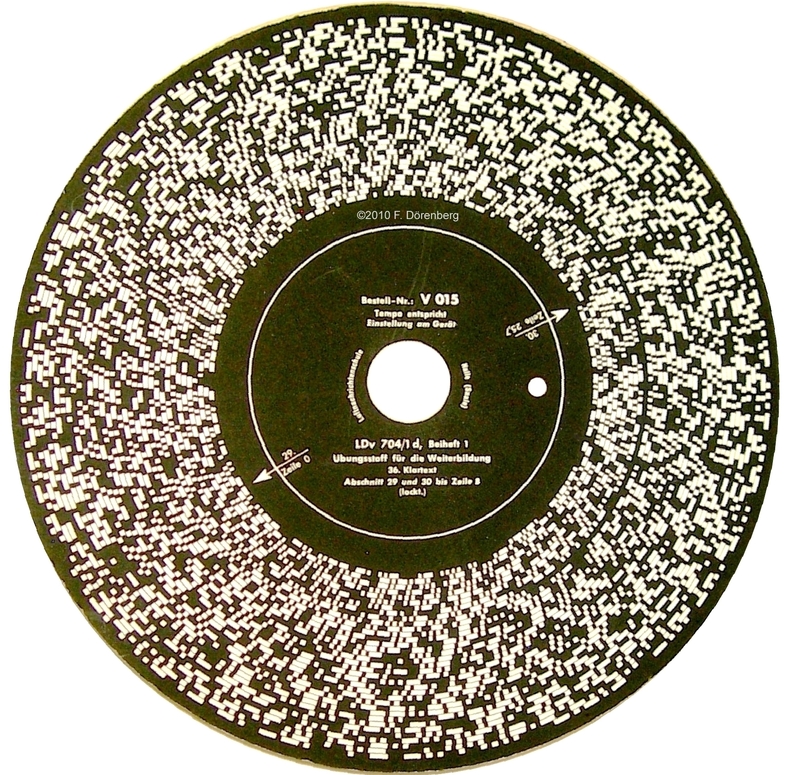 Here, information bits are implemented as small reflective indentations ("pits") on the surface of the disk, and a laser is used as a light source. The single track spirals from the edge of the disc to the center - as on a gramophone record. Ref. 1: "Die Entwicklung des Hell-Schreibers" by the inventor himself: Rudolf Hell; pp. 2-11 in "Gerätentwicklungen aus den Jahren 1929-1939", Hell - Technische Mitteilungen der Firma Dr.-Ing. Rudolf Hell, Nr. 1, May 1940. Ref. 2: "Siemens-Hell-Schreiber", Fritz Schiweck, pp. 149-166 "Fernmeldetechnik", Band 9 of “Lehrbücher der Feinwerktechnik“, 1st ed., 1942, 526 pp., C. F. Winter'sche Verlagsbuchhandlung. Ref. 3: "Stand der Siemens-Hell-Fernschreibtechnik", Rudolf Zimmerman, Siemens & Halske A.G. - Wernerwerk, Technische Mitteilungen des Fernmeldewerks, Abteilung für Telegrafengerät, SH 7997. 0,5. 1043. TT1. M/1401, May 1940, 10 pp. (courtesy Siemens Corporate Archives, München). Ref. 4: "Der Siemens-Hell-Schreiber", Alexander B. Damjanovic, Zeitschrift für Fernmeldetechnik, Werk- und Gerätebau, Siemens & Halske A.G., Wernerwerk, Jg. 17, Nr. 12, 1936, 7 pp., SH 6654, 1. 37. 0,5 T.
Ref. 5: "Bandbreitenfragen bei Anwendung der Siemens-Hell-Fernschreibtechnik" [signal bandwidth issues with A2 and A3 modulation], Rudolf Zimmermann, 7 pp., Technische Mitteilungen des Fernmeldewerks, Siemens & Halske A.G., Wernerwerk, Abteilung für Telegrafengerät, Berlin-Siemensstadt, May 1940, SH 7998, 1. 8. 40. T T1, 7 pp. Ref. 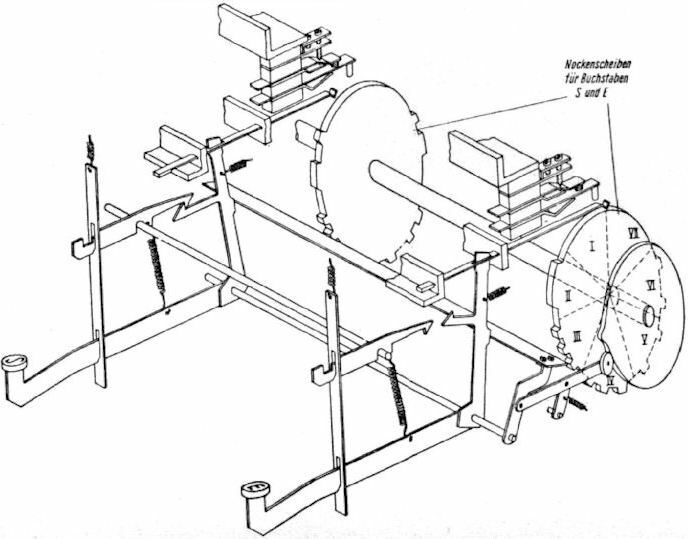 6: "Der Siemens-Hell-Feldschreiber", by Rudolf Hell's co-workers G. Ege and H. Promnitz, pp. 11-20 in "Gerätentwicklungen aus den Jahren 1929-1939", Hell - Technische Mitteilungen der Firma Dr.-Ing. Rudolf Hell, Nr. 1, May 1940. Ref. 8: "Elektrisches Nachrichtenwesen - Telegraphie", p. 535 in "ETZ: Elektrotechnische Zeitschrift Ausgabe A", Jg. 59, Heft 20, 19 May 1938. Ref. 9: "Der Hell-Schreiber”, pp. 15-19 in “Einführung in die Nachrichtenübertragungstechnik”, Volker Aschoff, Springer-Verlag, 1968. 147 pp. Ref. 10: "Siemens-Hell-Schreiber", §4.3.2.1 (pp. 948-951) in "Nachrichtentechnik", Vol. 3 of "Taschenbuch Elektrotechnik", Eugen Philippow, VEB Verlag Technik, 1967, 1624 pp. Ref. 11: Siemens-Hell-Schreiber „GL““ T typ 72 c – Beschreibung", St Bs 1211/2, October 1955, 31 pp. + schematics , Siemens & Halske AG, Wernerwerk für Telegrafen- und Signaltechnik, T Werb 2880 R GN, 956.0,2 [52 MB]. Ref. 12A: "Der 7-Frequenz-Funkschreiber der Les Laboratoires L.M.T. ", L. Devaux, F. Smets, Elektrisches Nachrichtenwesen (German edition of "Electrical Communication" of International Standard Electric Corp.), Volume 17, Nr. 1, December 1938, pp. 22-34. Ref. 12B: "L.M.T. Laboratories 7-Frequency Radio-printer", L. Devaux, F. Smets, Electrical Communication (quarterly journal of International Standard Electric Co.), Vol. 17, No. 1, July 1938, pp. 22-34. Ref. 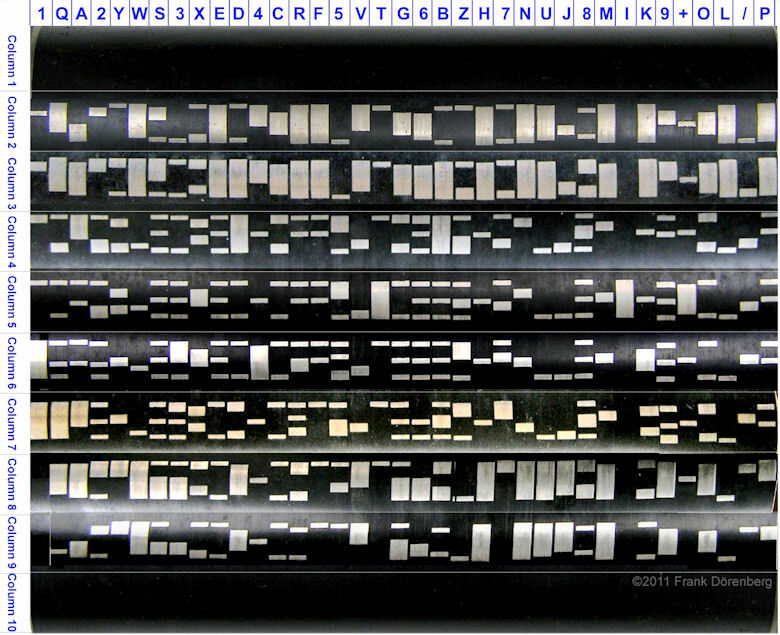 13: "Der 7-Frequenzen-Schreiber" [7-tone printer], pp. 166-167 in "Fernmeldetechnik", Band 9 of "Lehrbücher der Feinwerktechnik", Fritz Schiweck, 1st ed., 1942, 526 pp., C. F. Winter'sche Verlagsbuchandlung. Ref. 14: "Abtast-Telegrafen" [incl. Presse-Hell, Feld-Hell, 7-tone], chapter IV in “Taschenbuch für Fernmeldetechniker", H.W. Goetsch, Oldenbourg Verlag, 1940, pp. 411-427 of 787. Ref. 15: "FACIT 4552 Strip printer - Technical description”, 4552.13.01.Eng.10M.9.71, 12 pp, 1971. Ref. 16: "Facit 4552 Alphanumeric Strip Printer” [brochure], 4552.02.03 Eng 10M.12.72, 2 pp., 1972. Ref. 17: "Der Siemens-Hell-Schreiber", Siemens & Halske A.G., Siemens Fernmelde Technik, SH 8354. 443. TT1, 1943 [courtesy Siemens Corporate Archives, München]. Ref. 18: "Hell-72 "GL" Start-Stop-Sender, Start-Stop-Empfänger", Siemens Hell-Technik, T Ausbildung S-Hell, Änderung 1, pp. 7-8, SuW 2957 R, 559.0,2. Ref. 19: "Finger board telegraph key", Elmer E. Mullinix, United States Patent Office, Patent No. 530857, filed 31 July 1894, issued 18 December 1894, 5 pp. Ref. 20: "Instrument for the teaching and practice of telegraphy", Charles E. Chinnock, United States Patent Office, Patent No. 736936, filed 27 April 1901, issued 25 August 1903, 4 pp., and Patent No. 773374, filed 20 January 1902, issued 25 October 1904, 4 pp. Ref. 21: Construction drawing for a home-made Omnigraph. Ref. 22: "Siemens-Hell Transmitter "S" T send 62a - Description and Operating Instructions", Siemens & Halske AG, Wernerwerk für Fernmeldetechnik, St Bs 1213/1 e, March 1953, 25 pp. Ref. 23: "Der Feldfernschreiber", document D 758/1 of the Oberkommando des Heeres, Heereswaffenamt, Amtsgruppe für Entwicklung und Prüfung, Berlin, 1 April 1941. Ref. 24: bottom of page 154 "Siemens-Hell-Schreibers", pp. 149-166 in “Fernmeldetechnik“, Band 9 of “Lehrbücher der Feinwerktechnik“, Fritz Schiweck, 1st ed., 1942, 526 pp., C. F. Winter'sche Verlagsbuchandlung. Ref. 25: pp. 28-30 in "The History of Stainless Steel", Harold M. Cobb, ASM International, 2010, 360 pp., ISBN: 1615030107 / 978-1615030101. Ref. 26: "Herstellung von Gegenständen, die hohe Widerstandsfähigkeit gegen den Angriff durch Säuren, und höhe Festigkeit erfordern (Gefäße, Rohre, Maschinenteile usw. ), nebst thermischen Behandlungsverfahren", C. Pasel, German patent nr. 304159 (DE000000304159A), Kaiserliches Patentamt, December 1912. Ref. 27: "Verfahren und elektronischer Vorrichting zur Aussendung von Schriftzeichen im Hell-Code oder einem ähnlichen Code für Blattschreiberempfang (Faksimileverfahren)" [Method and electronic device for transmittal of characters in Hell-code or similar code, for sheet-printers (facsimile method)], Rudolf Hell, Deutsches Patentamt, Patentschrift 1086738, filed 27-Dec-1958, awarded 11-Aug-1960. Ref. 28: "Electronic method of and apparatus for transmitting characters for facsimile sheet printing reception", Rudolf Hell, US Patent 3255313, filed 24-Dec-1959, awarded 7-Jun-1966. Ref. 29A: "Vorrichtung zum Aussenden von in Bildelemente zerlegten Schriftzeichen nach dem Hell-System mittels Impulsfolgen" [Device for the transmission with pulse sequences of characters that have been decomposed into pixels per the Hell-system. ], Deutsches Patentamt Patenschrift Nr. 969210, Dr.-Ing. Rudolf Hell, filed 29 April1954, awarded 30 April 1958. Ref. 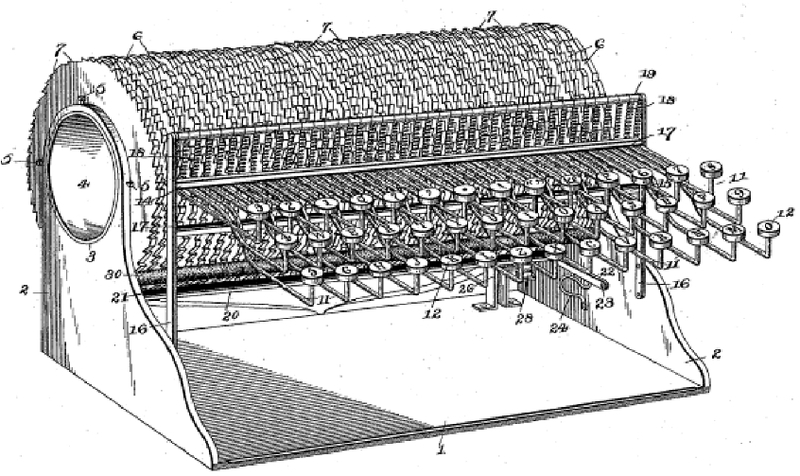 29B: "Apparatus for transmitting teleprinter characters", United States Patent Office, Nr. 2943148, Dr.-Ing. Rudolf Hell, filed 4 April 1955, awarded 28 June 1960. Ref. 30A: "Verfahren zur Richtungsbestimmung" [Method for direction finding (optical disks, quadruple antenna)], Reichspatentamt Nr. 757528, A. Lohmann, (Telefunken G.m.b.H. ); filed: 17-July-1936, awarded 17-July-1952. Ref. 30B: "Verfahren zur Richtungsbestimmung mittels rotierender Richtstrahlung" [Method for direction-finding with a rotating directional beam], Reichspatentamt Nr. 757524, A. Lohmann (Telefunken G.m.b.H. ); filed: 11-August-1938, awarded 17-July-1952. Ref. 31: pp. 96-102 in “Die deutschen Funk-, Navigations-, und Funk-Funkführungsverfahren bis 1945“, Fritz Trenkle, Motor Buch Verlag, ISBN 3879436150,1st ed., 1979, 208 pp.